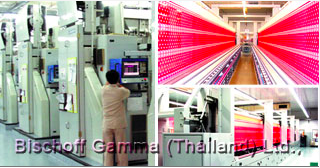 Bischoff Gamma (Thailand) Ltd. a joint venture company between Gamma Textile Mfg. Co., Ltd. and Bischoff Textil AG, the Swiss embroidery manufacturer - produces embroidery lace, embroidery allover & trimmings, motifs in various forms and finishes to meet the varied customer requirements in a wide range of applications for the domestic as well as the international markets. Products under the "Bischoff Gamma (Thailand) Ltd." brand name are widely used in a variety of related industries including home textiles, lingerie and ladies' fashion. The lastest fashionable trends in design, fabrics, yarns, colours and finishes are specifically developed to meet the individual customer requirements. Products under the "Bischoff Gamma (Thailand) Ltd." brand name are widely used in a variety of related industries including home textiles, lingerie and ladies' fashion. The lastest fashionable trends in design, fabrics, yarns, colours and finishes are specifically developed to meet the individual customer requirements.